• All cards and tokens in HD quality. • Automated deck builder tool with ability to pick random deck out of quadrillion possible decks. 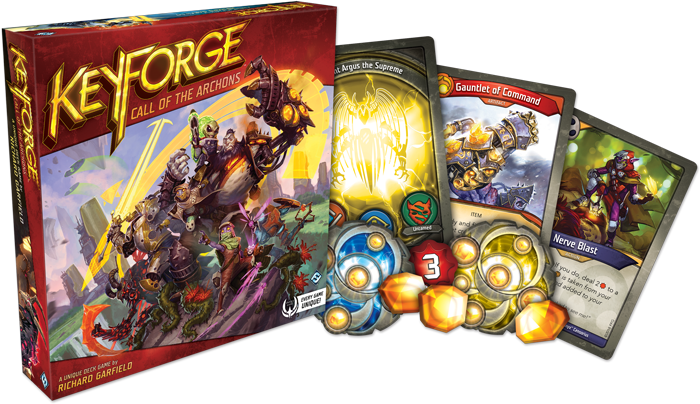 KeyForge is the world’s first Unique Deck Game. Every single Archon Deck that you'll use to play is truly unique and one-of-a kind, with its own Archon and its own mixture of cards in the deck. If you pick up an Archon Deck, you know that you're the only person in existence with access to this exact deck and its distinct combination of cards. In fact, in just the first set of KeyForge, Call of the Archons, there are more than 104 quadrillion possible decks! @phenomen Ok thanks, that's good to know. I've been playing hotseat to get familiar with how the mod works, but I wasn't going to go online if I couldn't get it to work right. But I'll give it a shot if it's likely just a hotseat problem. @ChillinWithTheCapuchins looks like you run game in Hotseat mode which is insanely bugged and it has nothing to do with mod. @famoman there are tokens on the side of the table. Just remove existing and add new ones. Great job. But... How can I change the three houses in the archon? Thank you so much for this, but I can't left click and drag an item without also creating a selection box, as if I wasn't dragging an item even though I am. It makes it difficult to drag a card from my deck or my hand without selecting multiple cards and items. I don't have this issue in any other game/mod. I can't seem to find any obscure setting or anything else I'm missing. Anybody have any ideas? @MarioFanaticXV it use official decks found by players in the packs, not generating brand new ones. Automated deck builder? So did someone actually figure out the alogrithm? @..oxy.. can you upload those models to workshop so I can use them in a save game? @Anesthesia use Decals! It's on the left menu. Just stamp decal on the card corner.